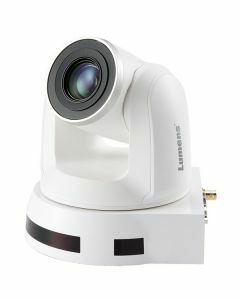 The Lumens VC-A50P HD Pan/Tilt/Zoom (PTZ) IP camera is equipped with a professional 1/2.8 inch image sensor with Full HD 1080p output at 60 fps. It’s power supplied through the Power over Ethernet (PoE) providing an economical and easy solution. The superior 20x optical zoom lens, excellent white balance, and exposure mode delivers a clear image even in low light or the extreme contrast of brightness and darkness in a lecture hall. The VC-A50P has different interfaces like Ethernet, HDMI, and 3G-SDI. It supports live broadcasting with MJPEG, H.264 / SVC format and further more its low-latency is less than 120ms. These features not only allow for simultaneous image outputs, they also result in the best image quality and is compatible with all video equipment. The camera covers a wide shooting angle and achieves high-speed, quiet, and precise positioning with smooth PTZ operations. The VC-A50P is applicable for lecture recording, videoconferencing, and live broadcasting. The VC-A50P is equipped with a professional 1/2.8 inch image sensor with Full HD 1080p output resolution. The sensor provides high color reproduction, high-definition signals, and crystal-clear image quality. Power supplied through the PoE+ (Power over Ethernet) without additional power supply and cables that bring cost-effective and simple installation. The VC-A50P has a wide shooting area (pan angle from -170° to +170° ; tilt angle from -30° to +90°), as well as quiet, fast, and precise positioning movements. The VC-A50P has multiple interfaces like Ethernet, HDMI, and 3G-SDI for simultaneous image outputs. The VC-A50P supports stereo audio input and AAC encoding transmission through the Internet, SDI and HDMI to extend the distance of the audio device. Through this transmission, sound quality is enhanced and installation costs are reduced. The VC-A50P supports MJPEG/ H.264 / SVC video compression format which reduce the bandwidth and it also supports low-latency and the fast response time is less than 120 ms so that allows human-unnoticeable delays between live image and streaming video. The camera’s settings and PTZ control functions can be performed remotely at any location and at high communication speeds via the RS-232/422 interface. Free Lumens camera control software for controlling Lumens PTZ cameras and pre-view function supports 1080p with 60fps video output. Easy to adjust camera pan, tilt, zoom operation, pre-set and image setting. The built-in web page allow you to use an IP browser to remotely view and control camera using a PC, Mac or mobile devices. IP video can be transmited to up to 5 terminals. VC-A50P can be upgraded to support NDI|HX technology for NDI-based video production.